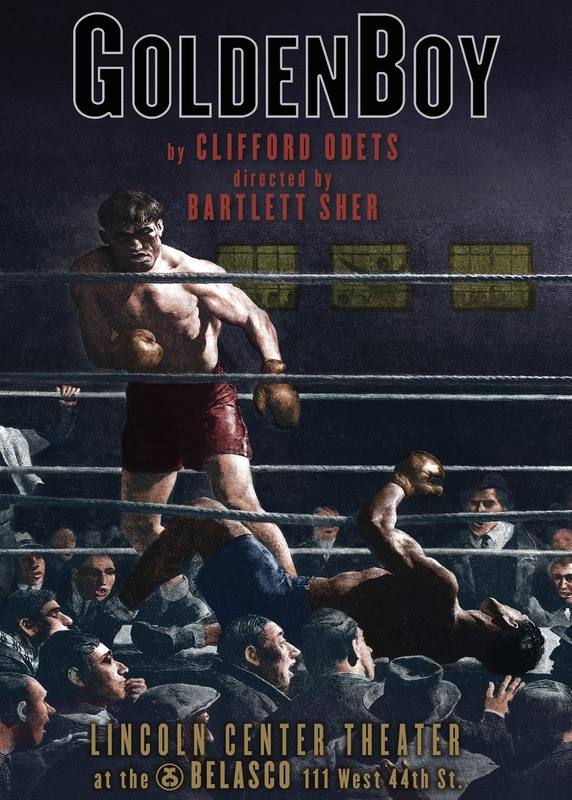 On November 8th, a new revival of Clifford Odets' Golden Boy begins previews at the Belasco Theatre on Broadway. The Lincoln Center Theater production is directed by Bartlett Sher and assistant directed by Noah Himmelstein, with costumes by Catherine Zuber and sets by Michael Yeargan. The cast of 19 is lead by Seth Numrich as Joe, Tony Shalhoub as Joe's father, Danny Burstein as Joe's trainer and Yvonne Strahovski as Joe's girlfriend. The story is about Joe, a young man who is struggling on whether to follow his talent as a brilliant violinist or a prize fighting boxer. While Odets was a successful playwright and a founding member of the Group Theatre in New York City, he apparently struggled with his own choice of making a living as a Hollywood screenwriter and the more artistic pursuit of writing solely for the stage. Golden Boy embodies this theme of his own personal struggles. I think many of us have experienced a version of this struggle at some point: do we do what we love or love what we do? I don't mind my day job, but I think if I did what I would really love to do - work full time in the arts - I would not live in the manner to which I'm accustomed. It's a small sacrifice since at least I am afforded the opportunity to be a patron. I have the opportunity to offer a voucher for two complimentary tickets to see a peformance of Golden Boy at Belasco between November 8th and December 13, 2012. I will randomly pick amongst commenters to this post - just tell me what you do for a living and what you'd rather do if you had the choice. I will leave the contest open through November 5th. 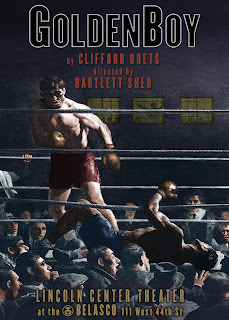 Golden Boy begins previews on November 8th, with an official opening on December 6th. It will play at the Belasco, on 44th Street. Tickets are available at the box offices of the Belasco or Vivien Beaumont in Lincoln Center, or online via Telecharge. There are times, but most often I want to be what I am now: SAHM homeschooling my crazy kids and taking field trips far/near when it's possible. I'm a stage manager, and if I had the choice I'd still be a stage manager, just one working on bigger shows! I'm a college administrator, but if I could I would work on my website (http://castalbums.org) full time. I run Club freeTime (www.clubfreetime.com) which lists free cultural events in New York City (Manhattan mostly) and gives its members an opportunity to reserve complimentary tickets to events like off-Broadway shows (with occasional Broadway show here and there) and classical music & jazz concerts. The site requires membership. Given a choice to start my work/business life over again I would choose it again. I'm a teacher and I love every minute but part of me wishes I could dance on the Broadway stage...just for one day! I'm a secretary at a midtown law firm and I love it ??? lol.. I would jump at the chance to be broke and happy while owning a souvenir stand in St. Johns or Aruba. If that doesn't work a glass bottom boat anywhere in the carribean would do !